Just a mile from the Orlando International Airport, you will find the Orlando Airport Marriott Lakeside. I’ve stayed at this hotel before, and it's a wonderful place for tourists and locals alike. I have also eaten at the hotels main restaurant Crimson Tavern on a few occasions. Crimson Tavern focuses on locally sourced cuisine with an impressive array of delights for breakfast, lunch, and dinner, and is redefining what hotel dining is all about. 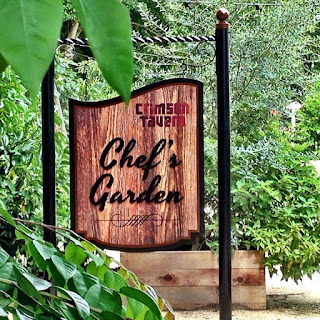 The property's management is comprised of a group of die-hard "foodies" and as a result, Crimson Tavern embodies what is on the cutting edge of the modern food movement: Farm-to-Table cuisine. Farm to Table has also gotten quite controversial recently as Laura Reiley, the food critic at the Tampa Bay Times wrote an article worthy of a Pulitzer Prize titled Farm to Fable. In the series of articles, Laura goes in depth to report and investigate how the average restaurant consumer is being lied to about where Tampa Bay area restaurants were sourcing their food from. You can bet this happens in Orlando and all over the country as well. I bring up the article from the times, because Crimson Tavern is one of the few restaurants that I know of, that you can see with your own eyes where they source food from. The restaurant has its own 2,500 square foot Chef's Garden and the culinary team works hard to develop partnerships with many of Orlando's best purveyors to source the finest ingredients available in the region. It isn’t too often that many of the items which appear on a diner’s plate come from just a few hundred feet away. In the restaurant’s own chef’s garden, diners are invited to take a stroll through the nearby 2,500 square foot area and see what is ready to be harvested and will soon end up on the menu or quite possibly, on their plate that very evening. Executive Chef Anthony Hull also pulls from his own roots back in England and resurrects many old school cooking techniques including pickling, jamming, and preserving to prepare much of what diners see on the menu. Chef Hull, truly strives to define the “farm to table” culinary movement with a philosophy that includes a strong connection to the surrounding farms and artisans. They also invite the local farm community to grow for them, which helps these farms to sustain a way of life. I was recently invited to a special Milk & Honey dinner where we sat outside in the chef’s garden. The theme of course was food and drinks made with or using milk and honey infused products in the ingredients. Our first beer pairing was the Swamp Head ‘Wild Night Honey Cream Ale.” That honey you see next to the beer is from While the Sun Shines Apiary in Central Florida and is about as fresh and delicious as honey can be. The Swamp head went really well with the first course of Charred House Ricotta with garden greens, preserved lemon and crispy garbanzo. Our second course was a dish of local seafood that featured jumbo shrimp, fresh fish and crispy frog legs in a coconut curry sauce with cauliflower. This dish was paired with a Loveblock Sauvignon Blanc. For our third course we had a rather special treat of a homemade ‘Fwaffle” which is a waffle made with Foie Gras served with crispy chicken skin sausage and honey braised shallots with a house vinegar gastrique. The “Fwaffle” was paired with Ten Ten Havakon Milk Stout that gave a nice amount of sweet and bitter to compliment the meal. In an effort to showcase how Chef Hull and his team recycle and reuse food in a variety of interesting ways, we were treated to house baked bread with a candle made of rendered lamb fat. As the candle burns, it creates quite a flavorful dip for the bread. Our fourth course was a dish of milk fed lamb “Pot au Feu” with bunching onions, potatoes and heritage carrots. This was perhaps some of the most flavorful and tender lamb I have ever tasted. We were served “Sir Adrian’s Mead” for our drink...which is a house made alcoholic beverage made with fermented honey and various spices….and is very potent. For a palate cleanser before our final course, we enjoyed Hibiscus Tea picked right from the garden. Our fifth and final course for the evening was a fabulous Warm Olive Oil cake with house spun whey ice cream, smoked honey and strawberry. -Scraps from the roasted beets are used to make the beet cured salmon appetizer. -When fish are cleaned in the restaurant, the skins are boiled and pureed into cat food for the two rescue cats that live in the garden and keep the squirrels and snakes away. -The kitchen dehydrates onion peelings to make onion powder, and mushroom stems for powder to add to the house-made steak seasoning for additional umami flavor. -When there is an abundance of fresh herbs from the Chef’s Garden, they are dried to save and use at a later date. -If there is an excess of any items harvested that cannot be used fresh, they are pickled and preserved. -Beef fat is rendered and put into the Béarnaise sauce. The hotel is also experimenting with making beef fat candles, which can be served to guests who can dip bread in the fat as it melts. -All bacon fat from breakfast is saved and used for braising greens, re-fried beans, and enriching the house-made barbecue sauces. -The restaurant menus are printed on 100% recycled paper, and when damaged or reprinted, old menus are cut up and used as underliners in the restaurant. -Used soap from guest rooms is given to a company called Clean the World who purifies it and reforms it into bars which are then sent to Third World countries. From communal tables to private dining rooms and microbrews to wine flights, Crimson Tavern has the perfect evening for you. Regional charcuterie, international cheese plates and many other seasonal specialties all have a place on the menu. 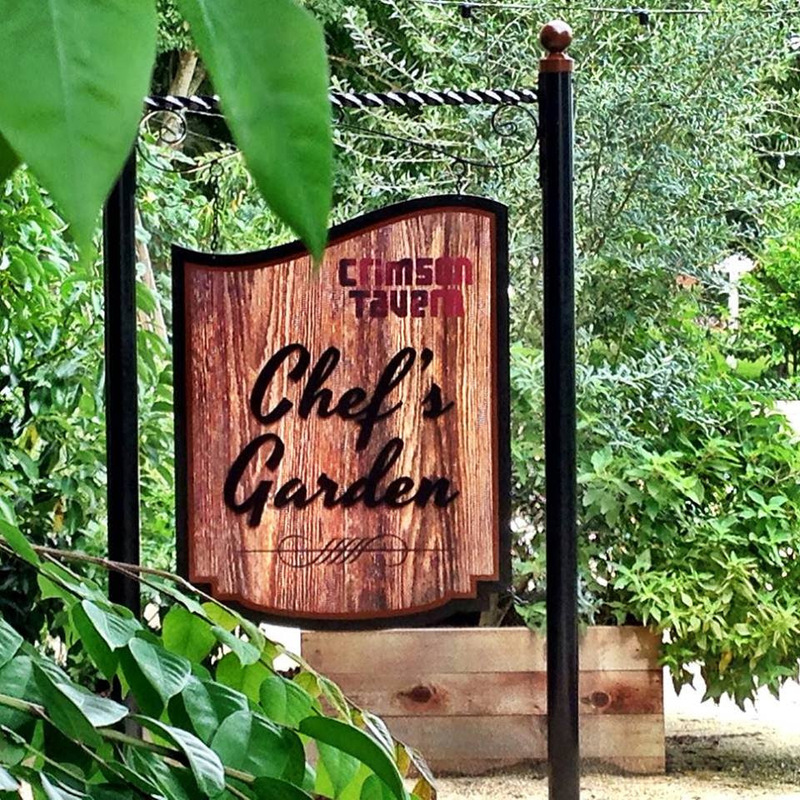 If you want a restaurant that is casual and friendly and offers locally sourced ingredients with an honest farm-to-table mentality that you can see up close and personal… stop by and say hello to Chef Hull and his team at Crimson Tavern. The restaurant can fit 80 people, the private dining room can seat up to 16, and semi-private dining on the upper deck is up to 30 guests. Lunch is served from 11:00 a.m. to 5 p.m. and dinner is from 5 p.m. to midnight.